Don’t put all your eggs in one basket! Easter’s On Its Way at BingoAustralia.com! Grab your Easter basket and go hunting for Egg-citing jackpots in the Egg-pic Room, Eggs-clusive Weekend Room, take part in the Easter Freeroll and main room Golden Egg hunt to WIN BIG. $400,000 LARGEST Easter Event Ever! Join us April 20th–23rd for our LARGEST Easter Event Ever! Four nights – Four Hours - $400,000 to be won! – EGG-pic Room. The action starts Saturday April 20th 12:00 noon AEDT Sydney time. $1,000 Easter Guaranteed Freeroll! - Hop on Over Every-Bunny! Saturday April 20th 11am AEDT . Hop to it! We've hidden $1,000 in Egg-citing FREE $100BB jackpot games in the EASTER BASKET Room! Join the egg hunt this April 19th @9pm EST and receive 25 free cards for each of the special games. Every-bunny will get to play (10) $100 BBS games... absolutely FREE! – No Deposit Needed (MUST BE IN THE ROOM TO WIN). Find the Golden Egg Chat Special (Saturday April 20th-23rd AEDT) . WIN BIG with our Golden Easter Egg Hunt in the MAIN ROOM all weekend long. Be on the lookout for the ‘GOLDEN EGG GAMES’, these are hidden throughout the main room line up, crack them open (Bingo on it) to reveal egg-xtra prizes (I.e. Team bingo seats, special deposit offers, cash and more) Half the fun is winning the Egg-citing JACKPOTS, but the other half is discovering what's inside...Get cracking! – No Pre-buys. Click on the homepage Facebook icon: Visit our page and guess the 'eggsact' number of eggs in the jar, YOU COULD WIN $250 BBS! This entry was posted in Blog on Apr 16, 2019 by Bingo Australia. 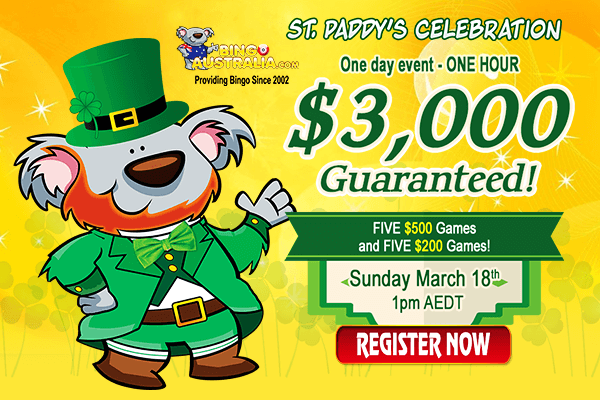 BingoAustralia wants to help you get lucky this St. Patrick's Day by offering a FREE GUARANTEED EVENT with fantastic prizes totaling $1,000 BBs. Ready to win your share? Check it out! There you have it, you don’t have to look for the end of the rainbow to find your pot of gold, let us bring the “Luck of the Irish” to you right before the primetime REAL CASH games in the main room. Plus! There's always a new way to win...DO YOU HAVE ANY BINGO GOOD LUCK CHARMS? Horseshoes, rabbit feet, or four-leaf clovers that you think brings you good fortune? Get lucky, or improve someone else's fortunes by sharing your favorite good-luck charm with us on facebook. We will draw five lucky players on Monday 18th EST, winners will receive EXTRA BINGO BUCKS to play their favorite real cash games. Get $50 Free when you sign up as a new player at BingoAustralia.com, one of the longest running online bingo sites on the net. Play Bingo & Slots Now! This entry was posted in Blog on Mar 14, 2019 by Bingo Australia. Join us during the luckiest month of the year and find your very own pot o’ cash at the end of the rainbow with $175,000 CASH up for grabs and $35,000 in GUARANTEED JACKPOTS! Deposit, play, and win…it’s that easy! Join us every Friday to Sunday between 11:00 PM and midnight EST for a whole hour filled with incredible bingo fun and lots of cash to be won. We kick start the night with a $100BBS four-leaf clover FREEBIE GAME to give everyone present extra luck as we play the $10,000, $5,000 and $2,500 Coveralls, followed by good luck charm(s) themed $250-$500 multipart GUARANTEED SEED games with an additional buy-in % in return that will make jackpots grow the more players join in the games - No Jackpot Cap. (60 Cards MAX). Not only there is more GUARANTEED CASH up for grabs this month, but the room will be greener than ever before…Buy tickets with BONUS money as well as cash and winnings. Plus! Everyone with a deposit made in the last 7 days will be entered to WIN EXTRA PRIZES in our new Winning Wednesday Giveaways. (Every Bingo Card Purchase = 1 Raffle Ticket for the Following Wed Giveaway). All games play for a low cost of $0.50-$1 a card and a Buy 30 get 5 Free offer that guarantees you will have winning good time – Prebuy your cards or join the room at least 5 minutes before the event starts, there is a jackpot waiting for you, don’t miss out. May the leprechauns dance over your bingo cards and bring you luck this month. Award season is now in full swing; we are rolling out the red carpet every weekend in January to host a $150,000 Bingo Event worthy of an Oscar. Win your share of over $25,000 in GUARANTEED JACKPOTS and prizes. But wait, there's more! Join us for our annual Chat Host Choice Awards on Facebook; hence, we've got lots of surprises in store for you! [Follow us on Facebook] to stay up-to-date with all of the latest bingo news and take part in the contest. Dress to impress roomies, the paparazzi will be waiting! Ready walk the red carpet? Sign up today! New members get a $50 FREE trial bonus and new depositors an incredible 1000% Welcome Bingo Bonus Deals. See you all in the bingo rooms! This entry was posted in Blog on Jan 10, 2019 by Bingo Australia. Bingo Lottery get your Tickets Now! Once your deposit is made, come and enter your numbers on the promotion page, or in the bingo lobby! Winners: redwrapper, jrfalconsmom3, redrobyn, squeekyninja. Join the www.BingoAustralia.com BINGO fun NOW and get your $50 Gift, no deposit needed! This entry was posted in Blog on Jan 3, 2019 by Bingo Australia. Now is your chance to strike it rich! 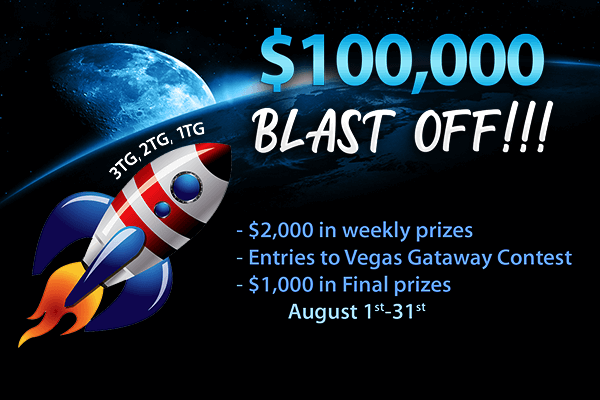 Win your share of OVER $2,019 in GUARANTEED CASH each nightly event this weekend. Come wager your luck on our new casino themed bingo games with over $50,000 up for grabs to help you start 2019 with your pockets full of cash and whole lot of fun. 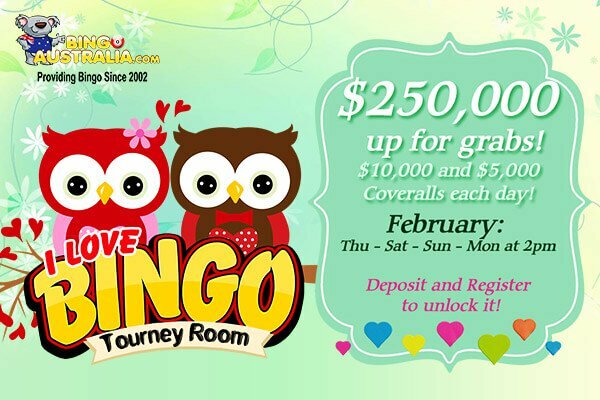 Join the Casino Bingo Room from 11pm till midnight from Jan 4th -6th, 2019 (EST) and place your bets on the $10,000 CA, $5,000 CA, and $2,500 Coverall, followed by $250-$500 multipart GUARANTEED SEED games with an additional buy-in % in return that will grow the more players join in the games - No Jackpot Cap. (60 Cards MAX). The stakes are high! Jump in chat and learn how to play black jack, gin, and Lucky 7 bingo style for your chance to win extra bingo bucks and stretch your playing time even more. So put on your poker face, and try your luck to win big bucks all weekend long. We can't think of a better way to ring in the New Year! We're going all in! And word to the wise – we aren't bluffing. Ready to join the fun? Sign up today! New members get a $50 FREE trial bonus and new depositors an incredible 1000% Welcome Bingo Bonus Deals. See you all in the bingo rooms! Holiday Bash with $10,000 in GUARANTEED CASH! Let’s party ‘til 2019! Ring in the New Year and say goodbye to the last with (5) $2,019 GUARANTEED CASH EVENTS! Our special games will play nonstop between 11:00 PM and midnight EST, that’s a whole hour filled with incredible bingo fun as we play for guaranteed cash prizes of $200 in every single game. All games play for a low cost of $0.50 cash a card and a Buy 30 get 5 Free offer that guarantees you will start the New Year with a bang. Can't make it? Why not take advantage of our pre-purchase option and get your bingo cards in advance? You can be the next BIG WINNER! Mark it on your calendar roomies, and get ready for the ultimate Holiday Cash Bash! We wish you all a prosperous, joyful, blessed and fortunate year ahead. This entry was posted in Blog on Dec 29, 2018 by Bingo Australia. This entry was posted in Blog on Dec 5, 2018 by Bingo Australia. Shopping Spree with $3,000 up for Grabs! Can you hear the sleigh bells ringing...? Santa's elf will once again be making a stop in the bingo rooms to deliver some goodies from November 26th - December 23rd. This year everyone on Santa's nice list will be entered to win a $1,000 CASH SHOPPING SPREE to spend on whatever your heart desires! Additionally, you also have the chance to WIN OVER $2,000 in WEEKLY CASH PRIZES, FREE Spins on your favorite slot, bonuses and more throughout the contest period. Weekly Prizes: 5 Nice Roomies! 4th and 5th Place: Get your last 2 deposits back as bonus. How do you Get on Santa's Nice List? We'll have DAILY Rankings, players will be awarded ONE POINT for every $1 wagered on Bingo, ONE POINT for every $20 wagered on Parlay slots and THREE POINTS for every $20 wagered on third party slots (3D Slots and Mobilots). Players need to make at least 1 single deposit of $50+ to enter the daily rankings. The top 5 scores of each day will qualify for the weekly cash draws. Ready to take part in this contest? Sign up today! New members get a $50 FREE trial bonus and new depositors an incredible 1000% Welcome Bingo Bonus Deals. See you all in the bingo rooms! This entry was posted in Blog on Dec 3, 2018 by Bingo Australia. This entry was posted in Blog on Nov 13, 2018 by Bingo Australia. Howdy roomies! The Rodeo has arrived to www.BingoAustralia.com and will play from Nov 1st - 30th with OVER $100,000 in CASH JACKPOTS, can we get a Yee Haw? This entry was posted in Blog on Nov 5, 2018 by Bingo Australia. Get ready to spin and win with these thrilling Slot Tournaments! Halloween is coming and our treats are ready for you kids! That's a total of $1,500 in magic CASH to be won! Every participant has great chances to win since we'll be having 3 random draw contests and 3 Top Players contests. Check out dates and rankings below. This entry was posted in Blog on Oct 25, 2018 by Bingo Australia. Earn an entry into our STRIKE IT LUCKY Depositors Draw! so everyone with at least 1 raffle ticket has a fair chance to strike it lucky. The lucky winner will have the choice to pick one prize among the five options below. Double the daily bonus on the next (3) Deposits, regardless of the amount deposited. Receive BACK in bonuses the total amount deposited over the week. For example, if you deposited $200, you will receive a HUGE $200 Bonus. An EXTRA 100% Deposit Bonus on your next (4) Deposits, regardless of the amount deposited. 4 Team Entry Tickets (One Weekly). $100BBs Voucher to play your favorite games! The amount will be paid out in 4 $25BBs weekly installments. (No Deposit Required). Make a deposit today and start earning entries. And remember, you can check our previous winners below! This entry was posted in Blog on Oct 23, 2018 by Bingo Australia. Bingo Howl-O-Scream with Over $100,000 up for Grabs! This entry was posted in Blog on Oct 8, 2018 by Bingo Australia. Ready for $250,000 treats, lots of fun and all things spooky? 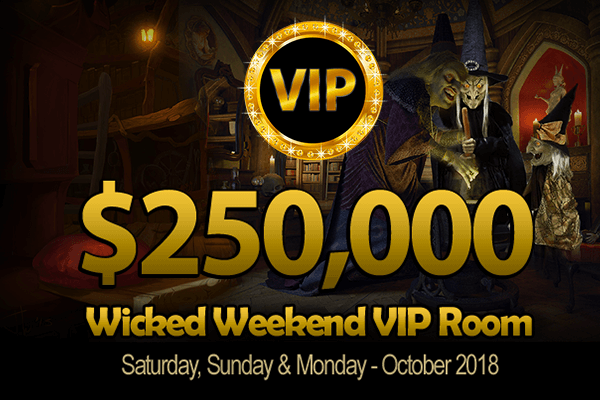 Starting October 6th and until October 29th play in the NEW Wicked Tournament with $250,000 CASH up for GRABS and OVER $15,000 in GUARANTEED CASH to be won! Prepare your witches brew and come join us to play every Saturday, Sunday & Monday at the witching hour of 12pm AEDT throughout October. DEPOSIT AND REGISTER with only $25 cash to unlock the room for each event, grab your broom and join the race to win HUGE JACKPOTS. As if that wasn't enough, bingo on the Flying Monkeys, Broom and Witch Hat patterns on a single tournament to WIN A FREE SEAT for the next weekend. (Submit game ids via support ticket). Come in my pretties, eeeheheehe! (Cackling Witch). BingoAustralia.com is part of the well-established TheBingoAffiliates network and the best site for Aussie players. New mates get a $50 FREE trial bonus and new depositors an incredible 1000% Welcome Bingo Bonus Deal. See you all in the bingo rooms! This entry was posted in Blog on Sep 27, 2018 by Bingo Australia. We are turning your Saturday and Sunday into a HUGE JACKPOT WEEKEND! You will be counting down the days for the weekend to take part in this epic tourney. And guess what? Your Mondays in September will be full of excitement and big jackpots as well because this special VIP Room will also open on Mondays for our Australian players! Starting on Saturday September 8th, our VIP Weekend Room will offer $250,000 up for grabs, and you can win it all! Come join us to play every Saturday, Sunday and Monday at 12pm (AEDT) throughout throughout September - Then sit back, and kick up your feet. Relax! You've earned it, let the real winning begins! You must be registered by 11am each day of the event! Follow us on Facebook to stay tuned on upcoming new ways to win, exclusive deposit deals and freebie offers. See you very soon.. This entry was posted in Blog on Sep 10, 2018 by Bingo Australia. Win a Trip to Cancun or $100,000 Cash! Every day in September join our www.BingoAustralia.com Main Room for your chance to win HUGE jackpots! Every time you win one of our special $100,000 Cancun Contest patterns you will automatically be entered into our Grand Prize Draw at the end of the month. This entry was posted in Blog on Sep 6, 2018 by Bingo Australia. The countdown has begun, join us starting this month for your chance to win OVER $100,000 in GUARANTEED CASH and lots of EXTRA PRIZES. All while having a blast in chat! All games carry a 3TG, 2TG, 1TG EXTRA PRIZE and an incredible BLAST OFF % JACKPOT that grows the more players join in the games, allowing the pot to grow as big as the number of players who are trying to win it… there really are No Limits! These games are definitely not for the faint of heart. Ready to sign up?! New members get a $50 FREE trial bonus and new depositors an incredible 1000% Welcome Bingo Bonus Deals. See you all in the bingo rooms! This entry was posted in Blog on Jul 31, 2018 by Bingo Australia. Our acclaimed $500,000 VIP Tourney Room takes you to Vegas! July 5th – Sept 3rd 2018. Deposit and register to unlock it! You heard it right! The rewards keep on coming for BingoAustralia.com VIPs. The RELOADED $500,000 VIP Tourney Room is now taking you to Vegas! Why is it our VIP Room so famous? Well, besides the HUGE Coveralls and the guaranteed cash prizes, every player has exactly the same chance of winning one or all of the fantastic prize pots for the same flat fee, giving you bigger bang for your buck. The $25 CASH fee covers the automatic pre-bought cards for all games, including a $15,000 CA, a $10,000 CA and a $5,000 CA followed by $100-$500 multipart GUARANTEED GAMES (Fair and Square/12 cards per game). Save your seat: $500,000 VIP Room plays every Wednesday, Friday, Saturday & Sunday at 10pm (EST) from July 4th to September 2nd 2018. You must be registered by 9pm each night of the event! We are dedicated to rewarding our loyal roomies; hence, we've got lots of surprises in store for you! Follow us on Facebook to stay up-to-date with all of the latest bingo news. This entry was posted in Blog on Jul 18, 2018 by Bingo Australia. Bingo Camp with $100K in Guaranteed Cash! Come to our Main Room and explore the many different ways you can win at BingoAustralia.com from July 1st and until July 28th, as we play for OVER $100,000 in GUARANTEED CASH, $3,000 in Extra Prizes and chances to collect points to participate in our Vegas Trip Main Contest! This Bingo camp is truly an adventure, and this year's activities will be one of the best ever! There will be plenty of jackpots and exciting games to experience, as well an opportunity to win a trip to Vegas - all while having a blast in chat! Card prizes range between 25c-$1, with fantastic GUARANTEED JACKPOTS of up to $1,000 CA$H, most games with a ‘Buy 15 tickets Get 5 Free’ price offer and a % in return that grows the more players join in the games. At the end of each contest week, we´ll put all participants in a magic hat and randomly select the (4) $500 Weekly EXTRA PRIZE winner (s) or credit the top players with most ranking points depending on the week! Remember, the more entries you collect, the more chances you have to win it. On August 2nd we will raffle off $1,000 in EXTRA PRIZES among all bingo players in the rankings. Don’t forget: Every Bingo win counts, so everyone in these rankings will earn points into the Trip to Vegas giveaway! We'll cover your flight plus 3 Night stay in the famous MGM Grand Hotel and $500 spending CASH! Take part in the camp activities to increase your chances of winning! Click HERE if you want to find out more about the Vegas getaway contest. We will also raffle off extra tickets among all players that deposited within the present contest week, active players on Facebook and/or chat! Follow us on Facebook to learn more details. Experience the thrill of hitting the bullseye all week long, put your release on your wrist, knock an arrow, and then set the bow down at a good distance to hit the target and win incredible jackpots. Collect as many contest patterns as you can and take home one of our prizes at the end of the contest week. Be on the lookout for the Bullseye, Arrows, and Target patterns worth up to $150+ CASH, persist in your efforts and you will soon be able to shoot an arrow right on target. The top FIVE players will receive extra bingo buck prizes: 1st Prize $200, 2nd Prize $150, 3rd Prize $75, 4th Prize $50, 5th Prize $25. Stargazers will want to dig out their binoculars and telescopes this week! We are gazing at the stars from the Main Room Observatory, you don't need to be an astronomer to find stars or constellations, just head over to the bingo rooms to find as many bright constellation patterns as you can for your chance to win up to $150+ CASH GUARANTEED. Contest Patterns: Bingo on the Crab, Queen, Cassiopeia, Lyra, Ursa Minor, Pisces, and Ursa Major to take part in our random draw for these bingo buck prizes: 1st Prize $200, 2nd Prize $150, 3rd Prize $75, 4th Prize $50, 5th Prize $25. Let’s hit the outdoors! Go on a hike, hunt for fireflies, climb a tree, look for bugs, and watch the sunset, while playing for guaranteed jackpots of up to $150+ CASH... Bingo on the ‘Outdoors’ themed patterns to build up points on the leaderboard and climb towards our top FIVE spots in the ranking to win bingo buck prizes! 1st Prize $200, 2nd Prize $150, 3rd Prize $75, 4th Prize $50, 5th Prize $25. Contest Patterns: Hike, Fireflies, Tree, Bugs, and Sunset. We’ll have outdoor fun- rain or shine! Don’t miss it. How do you make a Bingo S'more? Bingo on one of the graham cracker halves patterns, add a chocolate pattern to fit your graham cracker. Put a marshmallow pattern (or two) on the stick and hold it over the fire until you roast a perfectly delicious jackpot of up to $150+ CASH GUARANTEED. As if that wasn’t fun enough, all players who manage to bingo on (2) graham crackers, (2) Marshmallow, (2) Chocolate, and (1) Stick during the week can claim a 100% Deposit bonus on their next deposit. Must claim bonus within 7 days of winning via ticket and include game IDs to confirm wins. All players with at least one contest pattern win, will take part in a raffle for these amazing extra bingo buck prizes: 1st Prize $200, 2nd Prize $150, 3rd Prize $75, 4th Prize $50, 5th Prize $25. 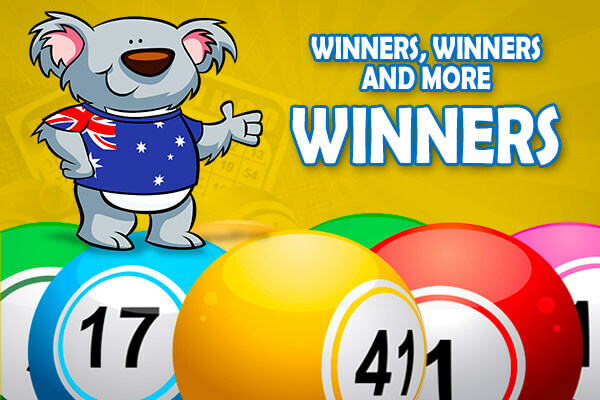 Weekly winners will be announced on our BingoAustralia.com Facebook page! Ready to join the fun? New members get a $50 FREE trial bonus and new depositors an incredible 1000% Welcome Bingo Bonus Deals. See you all in the bingo rooms! Grab your popcorn, step right up and have a ball this Monday June 25th at 12pm in the Circus Tourney Room. This entry was posted in Blog on Jun 24, 2018 by Bingo Australia. This entry was posted in Blog on Jun 13, 2018 by Bingo Australia. This entry was posted in Blog on May 13, 2018 by Bingo Australia. There is going to be a Cinco de Mayo Fiesta in the VIP Room this Sunday, May 6th 12pm AEDT and you're all invited! The $25 CASH fee covers the automatic pre-bought cards for all games (Fair and Square/12 cards per game). You must be registered 11am AEDT the day of the event! This entry was posted in Blog on May 3, 2018 by Bingo Australia. 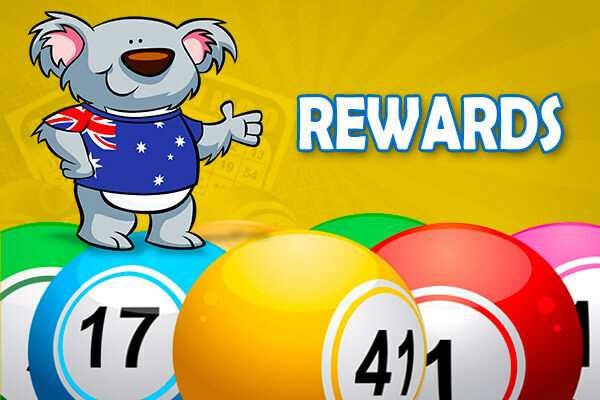 The rewards just keep on coming for BingoAustralia.com VIPs. The NEW VIP Tourney Room lives up to its name, exclusive, bigger jackpots as well as additional perks and rewards – designed to give you more winning chances! You'll become a very important player as soon as you register to play the exclusive fair and square games every Thursday, Saturday, Sunday & Monday at 12pm (AEDT) throughout April - Then the real winning begins! DEPOSIT AND REGISTER with $25 cash to unlock the room and you are in it to win it! Plus! Each Wednesday night (EST time) our Chat Host will select a roomie to be VIP of the week. The lucky player(s) will receive special gifts and bonuses throughout the week. This is the best online bingo tournament, climb your way up the loyalty ladder and you too can enjoy all the amazing benefits being a VIP can bring you at BingoAustralia.com. Players must be registered by 11am AEDT each day of the event. This entry was posted in Blog on Apr 18, 2018 by Bingo Australia. Find the Hidden Easter Eggs with Over $15,000 in CASH to be Won! Let's go on a hunt to find the hidden Easter Eggs with over $15,000 in CASH to be won. Come search high and low, register to play in the egg-citing Tourney egg hunt this April 2nd 1pm (AEDT) and see if you can find them all! Every player has Egg-xactly the same chance of winning lots and lots of cash hidden inside our eggs for the same $25 cash flat fee. Every-bunny will receive 12 cards per game to take part in the $10,000 CA, $5,000 CA, and $1,000 CA, followed by (3) x $250 GUARANTEED, (3) x $150 GUARANTEED, and (1) x $500 GUARANTEED Easter themed games full of egg-citement. DEPOSIT AND REGISTER to unlock this room! Register with only $25 cash and you are in it to win the jackpots! You must be registered by noon the day of the event! We've got lots of surprises in store for you! [Follow us on Facebook] to stay up-to-date with all of the latest bingo news for a little bit of EGG-XTRA GOOD LUCK. This entry was posted in Blog on Mar 30, 2018 by Bingo Australia. This entry was posted in Blog on Mar 27, 2018 by Bingo Australia. $25,000 Lucky Pot o’Gold Bingo Special! This Sunday March 18th at 1pm AEDT find your pot of gold in the Fair and Square Tourney Room special edition, where we will be giving away over $3,000 in Guaranteed prizes. (Five $500 games and Five $200 games) - Simply register with $25 cash and you are in it to win it – DEPOSIT AND REGISTER to unlock this room. Then find your own stroke of good fortune this St. Patrick's Day Weekend, bingo on the RAINBOW GAME carrying MAGICAL GUARANTEED JACKPOTS $500-$100, $250-$75, $150-$50, $100-$25 and win thousands in cash, over $25,000 up for grabs! The game is played randomly in the main room from March 17th-19th. This entry was posted in Blog on Mar 15, 2018 by Bingo Australia. Feel the luck of the Irish every Thursday, Saturday, Sunday and Monday at 1pm throughout March and find your very own pot of gold (Exclusive Room). You must be registered by midday each nightly event! $30K in GUARANTEED Bing-O-LYMPICS Games!!! Since we know everyone is a star at BingoAustralia, in addition to the pattern jackpots, we will also be raffling out bb prizes among all players in chat. This entry was posted in Blog on Feb 21, 2018 by Bingo Australia. $15,000 Chinese New Year Bash! Celebrate the ‘Year of the Dog ‘with OVER $15,000 up for Grabs and surprise fortune cookie giveaways this February 17th @1pm in the Doggy Room. This entry was posted in Blog on Feb 16, 2018 by Bingo Australia. WIN YOUR SHARE of $10,000 CASH! We are really lucky to have you as our roomie; come hang out with us this February 15th and let us show you how much we care. Want to be the first to know about our newest promotions and giveaways? Follow us on our BingoAustralia facebook page to stay up-to-date with all the latest bingo happenings. This entry was posted in Blog on Feb 14, 2018 by Bingo Australia. Love will definitely be in the air! 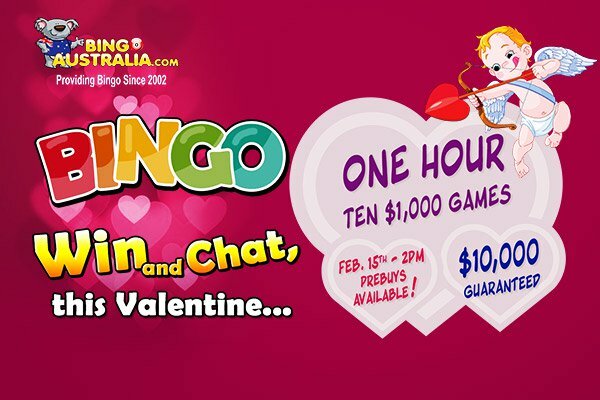 At BingoAustralia.com love isn't a one-night thing, our love for bingo will last all month long. February is a time for friends, fun, and winning, so get ready to yell bingo! You’ll love the jackpot action in the Bingo Tourney Room every Thursday, Saturday, Sunday and Monday at 2pm throughout February. (Exclusive Room – Deposit to unlock this room). This entry was posted in Blog on Feb 7, 2018 by Bingo Australia. $5,000 True Blue Weekend Event! 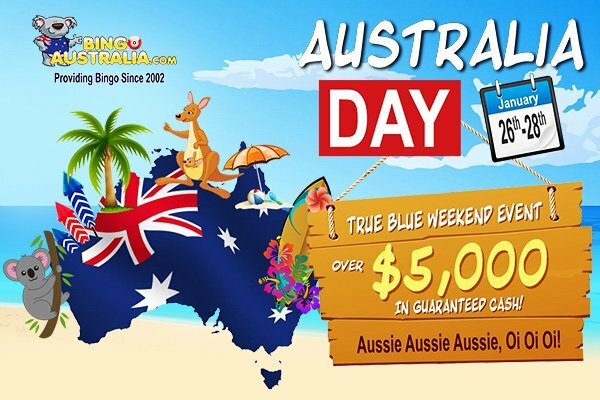 Celebrate what's great about Australia with $5,000 in GUARANTEED CASH and super fun chat trivia to test your true Aussie knowledge and a chance to win extra bingo bucks! Join the best Aussie bingo chat on the net every day in the Main Contest room this Jan 26th-28th weekend to reflect on what we have achieved and what we can be proud of in our great nation, while playing Australian themed games (90 ball Games, Snags, Passionfruit, Barbies, Pavlova, Lamingtons, Meat Pies, Vanilla Slice, Tomate Sauce, Vegemite and more) all with incredible $25-$200 GUARANTEED JACKPOTS, and the more cards in the game the bigger the pots. Come on out and make the pots bigger than ever! This entry was posted in Blog on Jan 25, 2018 by Bingo Australia. G'day mates! Just pack your bags and play already! Oh, the places we'll go! 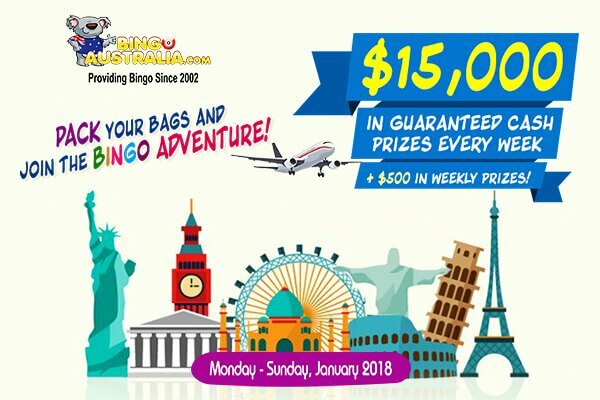 We're going on a bingo adventure, so get ready to bingo around the world and play for $15,000 in GUARANTEED CASH each week at BingoAustralia.com. We've created a list of the most incredible destinations you simply have to discover in 2018! Bingo on the most amazing places across the globe, promotion games carry a $25-$150 Guaranteed jackpot, each week a new country will be featured and total of $15,000 in GUARANTEED REAL CASH will be paid over the course of each contest week (Mon-Sun EST Time). Did you think that was all you were going to get? No! We will also have a special roomie perk, a ‘Passport’ bingo pattern will be playing every day to help you travel the world even further. Bingo on the special pattern to claim $15 EXTRA (BB) MILES FREE! Deposit and bingo on the ‘Password Bingo Pattern’, send a CS ticket with the game ID and we will credit your account with the “EXTRA MILES”. One amazing trip begins each week so let's prepare for a “bingoful” journey...! Become a savvy world traveler, DEPOSIT NOW and get your ‘Travel Ticket’ today. Bon voyage roomies!!! This entry was posted in Blog on Jan 17, 2018 by Bingo Australia. Are you feeling lucky? The New Lucky Bingo Tourney Room opens every Thursday, Saturday, Sunday & Monday at 2pm throughout January. (Exclusive Room – Deposit to unlock this room). BingoAustralia.com is part of the well-established TheBingoAffiliates network and the best site for Aussie players. New mates get a $50 FREE trial bonus and new depositors an incredible 1000% Welcome Bingo Bonus Package. See you all in the bingo rooms! This entry was posted in Blog on Jan 10, 2018 by Bingo Australia. End of the Year Bingo Bash! BingoAustralia.com is throwing the best bingo party the holidays have ever seen! Ring in the New Year and say goodbye to the last with TWO $2,018 CASH Bingo Events! First Event: starts an hour before Midnight on December 31st. 5,4,3,2,1 Bingo!!! Join us at 11pm AEDT for a whole hour of nonstop special games. You’ll have the chance to win NINE $200 games + ONE $218 game for a big total of $2,018 in GUARANTEED Cash prizes! BingoAustralia.com is part of the well-established TheBingoAffiliates network. New members get a $50 FREE trial bonus and new depositors an incredible 1000% Welcome Bingo Bonus package. See you all in the bingo rooms! This entry was posted in Blog on Dec 27, 2017 by Bingo Australia. BingoAustralia’s FAMOUS 12 Days of Christmas is back for 2017 and even BIGGER than last year! Come enjoy your holidays with BingoAustralia.com and win over $30,000 in GUARANTEED cash and prizes. This is by far the most favorite time of year for our roomies … the cozy winter patterns, Christmas facebook giveaways, snowmen and gingerbread games…. but mainly because the 12 days of Christmas is back with 12 WHOLE DAYS OF GIVEAWAYS!!! In addition to our special Christmas patterns, every day following for 12 days in total will be a brand new AMAZING CONTEST GIVEAWAY featuring different task or challenges! One lucky player will have a chance to shake our Christmas tree filled with additional cash and prizes, such as beautiful pieces of jewelry, Amazon gift cards, bingo bucks, cash prizes and more! Make sure to follow along for the whole 12 days on our facebook page and enter for your chance to win some DREAMY gifts!! Our special 12 Days of Christmas patterns will play from December 14th - 25th in our Main room.Watch and Win the special contest game patterns and you´re on your way to winning. Special Games: Christmas Wreath, Christmas Tree, Christmas Bell, Snowflake, Reindeer, Gifts, Hot Cocoa, Blanket, Candy Cane, Santa's Cookies/Milk, Basket Gift, Santa's Letter, Ginger Bread, Poinsettia, Ginger Bread/Sugar Cookie. Plus! On January 2nd, 2018 we will have our grand prize draw from all entries earned during the month of December celebration. One lucky player will walk away with $1,000 CASH. Merry (early) Christmas and GOOD LUCK TO ALL! This entry was posted in Blog on Dec 23, 2017 by Bingo Australia. Get ready cause BingoAustralia.com will make your Birthday month even more special! 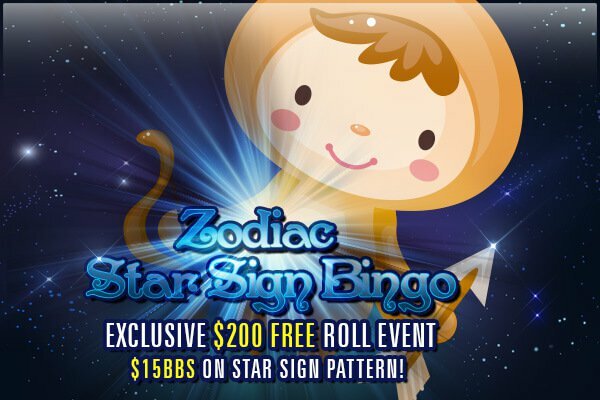 Join the fun in the new Zodiac Star Sign Bingo Event each month to celebrate each star sign! Not sure that your birth information is in your profile? 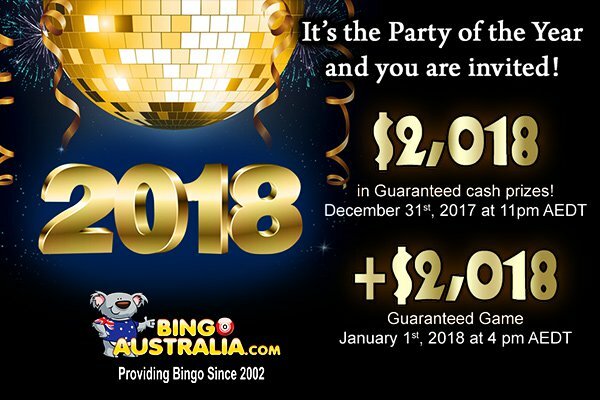 Log into your account, go to your profile and update it, BingoAustralia.com is part of the well-established TheBingoAffiliates network and the best site for Aussie players. New mates get a $50 FREE trial bonus and new depositors an incredible 1000% Welcome Bingo Bonus Package. See you all in the bingo rooms! This entry was posted in Blog on Dec 5, 2017 by Bingo Australia. The holidays are here bingo mates, Santa Claus is coming to BingoAustralia.com sooner than expected! Santa’s Workshop Tourney Room will be open all December long with more chances to win, and bigger prizes to get! – How to participate? Deposit and register to unlock the exclusive room. BingoAustralia.com is part of the well-established TheBingoAffiliates network. New members get a $50 FREE trial bonus and new depositors an incredible 1000% Welcome Bonus package. See you all in the bingo rooms! BingoAustralia is part of the well-established TheBingoAffiliates network offering bingo games to bingo players from all over the world. This entry was posted in Blog on Aug 12, 2017 by Bingo Australia. Boogie Fever is spreading with $15,000 up for Grabs at BingoAustralia! 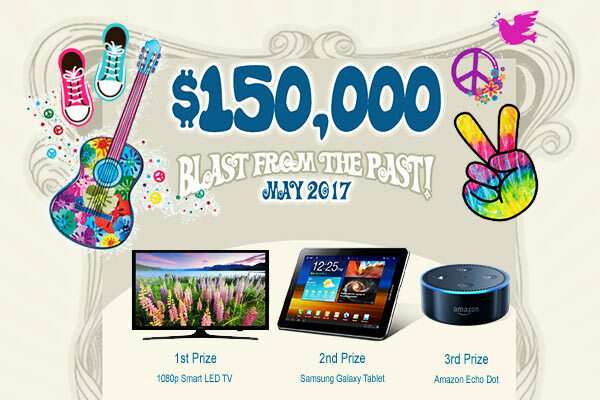 Dust off your bell bottoms for a party that really jives with $150,000 up for Grabs and amazing Grand Prizes at BingoAustralia.com Blast from the Past Contest. Don your afros, break out your platform shoes, its going to be a month of fun that just cant lose! Join BingoAustralia this May for a groovy good time. New members get a $50 FREE trial bonus and new depositors an incredible 1000% Welcome Bonus package. This entry was posted in Blog on May 10, 2017 by Bingo Australia. 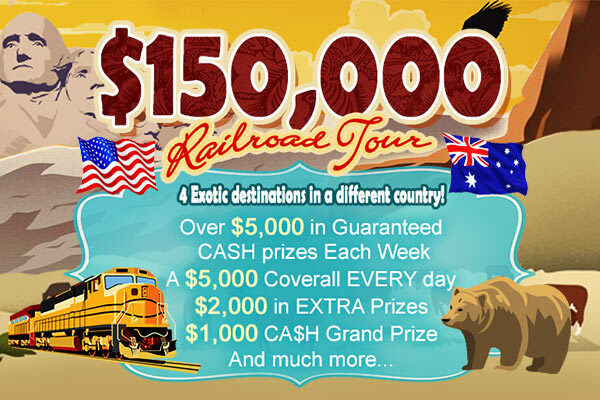 $150,000 Railroad Bingo Tour Invite! This month our Aussie mates are invited to travel coast-to-coast across the United States by train to what is promised to be one of the greatest bingo experiences ever. Ride the rails across the USA with $150,000 up for Grabs and tons of fun this April 2017. 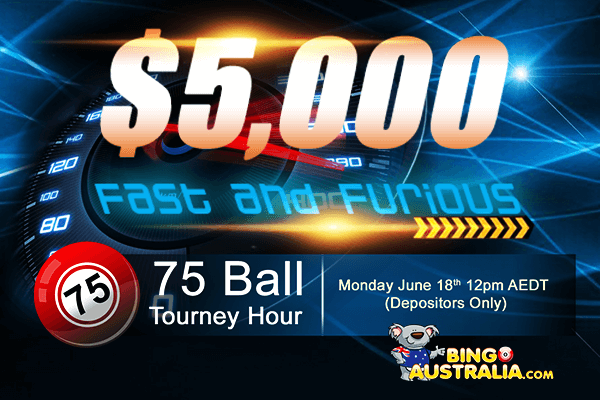 All Aussies will have the chance to win over $5,000.00 in GUARANTEED CASH EVERY week, a chance to hit a Jackpot of $5,000 EVERY day, the opportunity to win the $1,000 CASH Grand Prize plus over $2,000 in EXTRA Prizes this month in the Amigos shared bingo room! Join www.BingoAustralia.com in their Bingo Train adventure this April 2017 to win lots of cash along the way. New members get a $50 FREE trial bonus and new depositors an incredible 1000% Welcome Bonus package. All aboard the Amigos train! Register NOW! This entry was posted in Blog on Apr 12, 2017 by Bingo Australia. $150,000 Bingo & Casino Madness!!! Following a successful run last month, the $150,000 Weekly Adventures are back at BingoAustralia. But this time it’s bigger and better, with the addition of a Casino Weekly Tournament with extra prizes and four times as many chances to win a $500 CASH grand prize. 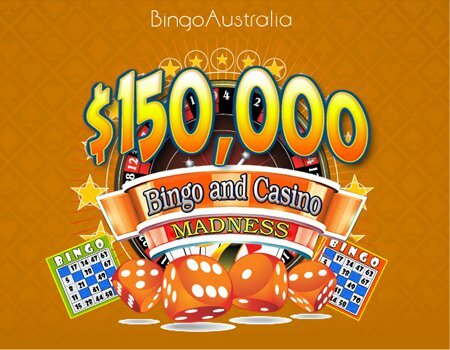 During March 1st – 31st BingoAustralia will host FOUR weekly contest and Casino Tournaments, in total worth more than $150,000 up for grabs, giving players the chance to win incredible jackpots all month long. Playing this promotion means joining one or all weekly bingo activities for the chance to win OVER $50,000 in GUARANTEED CASH, hit a $10,000 JACKPOT EVERY DAY, the opportunity to win (4) WEEKLY $500 CASH GRAND PRIZES plus over $3,000 in EXTRA Cash and Prizes, all while having a blast in chat! Players will enjoy bird watching, beach walks in the main room and a St.Patricks week among other activities. Players can't book ahead; they must be present to take part in the activities happening all day long in the main bingo room. Card prizes range between 25c-$1, with fantastic GUARANTEED JACKPOTS of up to $200 CA$H, all games with a ‘Buy 15 tickets Get 5 Free’ price offer and a % in return that grows the more players join in the games. Not a bingo player?... Don’t worry, we have you covered! EVERY week in March we will run a sensational Casino Draw for your chance to win additional cash and prizes! All you need to do is play ANY of our exciting Casino Games and you’re on your way to winning. Each win equals 1 point into the weekly Slots ranking. 5 players will win cash or bingobucks PLUS $500 Grand prize entries every week. The rest of players in the weekly Slots ranking will win ONE entry for the Weekly $500 Grand prize. At the end of each contest week, we´ll combine the two weekly Rankings (Casino and Bingo) and randomly select the $500 GRAND PRIZE winner! Remember, the more entries you collect, the more chances you have to win it. Plus, for the first time ever we will also raffle out extra tickets among all players that deposited within the present contest week, active players on facebook and/or chat! Follow us on Facebook to learn more details. 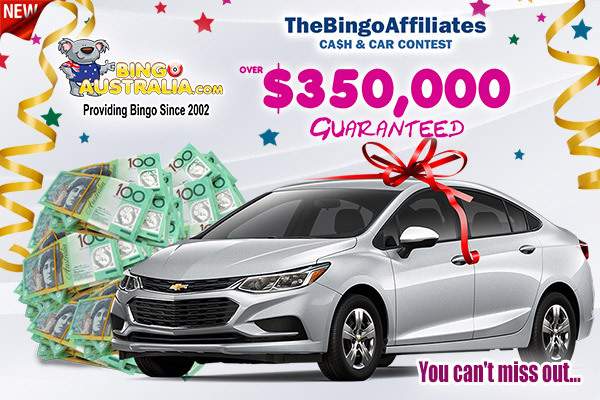 BingoAustralia has always been very popular due to their fun promotions offering excellent rewards and a lot of excitement for everyone involved. Join our growing bingo family, and start playing right away, this is something you don’t want to miss! This entry was posted in Blog on Mar 6, 2017 by Bingo Australia. As a true Australian bingo site, bingoaustralia.com is proud to offer a wide array of fun and affordable casino and bingo games. And with a multitude of payment options catering for players from down under and all over the world, making us exceptionally proud to call ourselves an Aussies! Players are spoiled with the greatest bingo community, amazing bonuses on EVERY deposit, $50 FREE to join, HUGE jackpots and incredible perks for the online gaming aficionado down under. Bingoaustralia.com has also picked up all the best features of its sister sites, offering the same easy to use bingo software as well as the usual plethora of great promotions, weekly prizes, huge progressive and exciting guaranteed games that have made this Aussie Network into such as success with players. This entry was posted in Blog on Jan 19, 2017 by Bingo Australia. 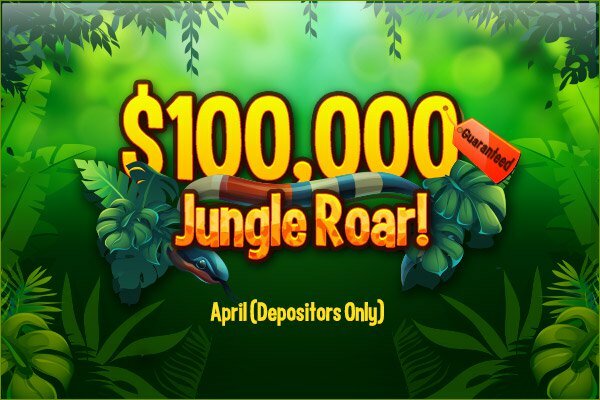 At BingoAustralia.com new players receive an amazing 1000% in bonuses over the first two deposits made - that's 600% on the first and a further 400% on the second. Those bonuses ensure plenty of opportunities to start exploring the site and getting to know what it is all about without breaking the bank. Meet our friendly chat hosts team that will keep you entertained while the jackpots will keep your adrenaline running high. When you make a first-time deposit 500% in bonus is credited immediately and the other 100% is claimed via the chat room. The same is true of the second time deposit bonus - 300% is immediate and the final 100% claimed in chat. In another unique feature, BingoAustralia sets no upper limit on the amount that can be deposited and still qualify for the bonus. At BingoAustralia we also believe in loyalty. This is why we reward Aussie friends and players with the most generous Loyalty Program in the web. Starting on your 3rd deposit our Loyalty Program will reward you with up to 800% Bonus on EVERY deposit you make! Pokie Tournament- Enjoy the outstanding graphics and the wide variety of themes. And most importantly, win HUGE on these amazing pokies! - Every win will get you 1 point into the weekly $500 Tourney. Plus! you can play our qualifying Slots with BONUS money as well as cash and winnings every day! This entry was posted in Blog on Jan 18, 2017 by Bingo Australia. Just this past month BingoAustralia players have taken home a daily average of $180,000 in cash prizes from the bingo rooms. In addition to the progressive bingo jackpots, there are also other regular exciting games such as the nightly $750 Coverall (every night at 10 pm) and the $100,000 Main Promotion Room. Last month we got to see RED4Xmas claim 24,770.00, and leisap took 19,690.47 in winnings while playing one of the popular pokie games. This is one of the many massive pokie wins we get to see throughout the month on any of the exciting pokies with huge PJPs. Look out for games such as Makin' Bacon, Three Time the Riches, and Trolling for Treasures as these are making record high jackpots. BingoAustralia has a huge selection of pokies and mini games – Over 50 popular games to choose from. Players can also play pokies for free using the ‘Play for FREE' feature under the games Tab. Bingoaustralia is always thinking of new ways to make players feel happy and improve their player experience. Playing bingo for just 1c is just the latest addition to the long line of treats - so, grab those bonuses and find out for yourself now. See you in the bingo rooms!